Sony has revealed a new IMX586 CMOS image sensor for smartphones that will consist of the “industry’s highest 48 effective megapixels” and a unique Quad Bayer array design. The sensor will feature an ultra-small pixel size of 0.8 micrometers–the tiny size allows for 48 megapixels in the 1/2-inch sensor. In most cases, increased pixel size results in each pixel collecting light less efficiently as well as a drop in sensitivity and volume saturation signal. But Sony has designed the product to counteract these problems. 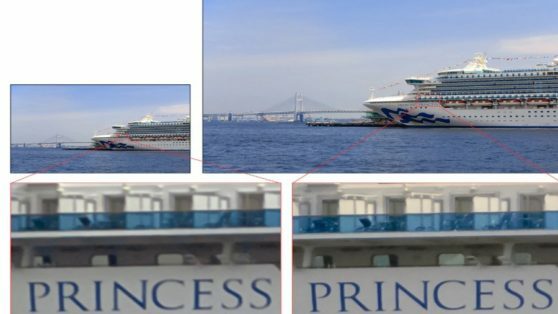 The digital zoom is showcased in the image below, comparing conventional image (12 effective megapixels) to the IMX586 image (48 effective megapixels). The Quad Bayer colour filter array, which consists of adjacent 2×2 pixels in the same colour, will deliver both high sensitivity and high resolution. In low light, the signal from the four adjacent pixels will be added, which will raise the sensitivity. In bright scenes (such as daytime outdoors) an array conversion will be formed by the original signal processing function, this results in high-definition 48 effective megapixel images. Finally, while viewing the image on a smartphone display, the sensor will be able to capture both light and dark scenes with minimal highlight blowout or loss of detail. This is obtained with Sony’s “exposure control technology and signal processing functionality” which will allow for a superior dynamic range and allow real-time output. Now, in the release there is a lot of technical jargon that will no doubt be lost on some, but what is important here, to put it simply, is that the sensor will let our smartphones capture extreme high-quality photos amid the digital zoom as well as capture better imagery in the dreaded low light conditions. The image sensor will also record 4K videos at 90 frames per second. While 48 megapixels is an impressive stat, the hardware is only half the equation. There are plenty of phones out there with high-resolution sensors taking mediocre photos because of crappy image processing software. The efficacy of Sony’s new sensor will depend in large part on the devices it lives in. You can read the press release here.